The Apple MacBook Air MQD32 Laptop boasts an amazing combination of looks and performance. Featuring an ultra-thin and slim body, this stylish MacBook is lightweight and portable. It is designed with a 1.8Ghz Intel i5 Dual-Core processor that ensures a glitch free performance every time. The 8GB RAM delivers a seamless multitasking experience. Additionally, the 128GB SSD storage offers high speed data access and is extremely power efficient. It helps you import huge files or launch multiple apps in a flash. Equipped with the Intel HD Graphics 6000 utility, this laptop makes your gaming sessions more interesting with enhanced graphics. 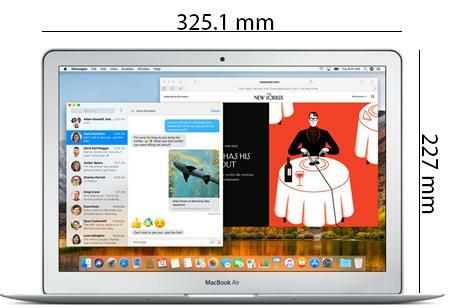 This MacBook has a 13inch screen that offers a stunning display resolution of 1440 x 900 pixels. The powerful battery gives you the freedom to keep going on and on for as long as 12 hours at a single full charge. The Apple MacBook Air laptop features a stunning silver finish that makes it look elegant and classy. Incorporated with an Intel Core i5 processor, this Apple laptop is brilliantly designed to suit all your computing needs. It is power efficient and uses less power, but delivers high performance. The 128GB SSD storage gives you up to 3.2GBps sequential read speeds while keeping the power consumption in check. Plus, the 8GB RAM module allows you to switch between multiple apps with ease. Also, the Intel HD Graphics 6000 utility allows for enhanced visuals and makes your games all the more immersive. The Apple MacBook Air laptop features a Thunderbolt 2 port for easy and instant sharing and transferring of data. The laptop is equipped with two USB 3.0 ports that connect to both similar devices and USB 2.0 devices without any problem. The MacBook also supports dual band WiFi connectivity and can sync with AirPort Extreme and AirPort Time Capsule with ease. Plus, the advanced Bluetooth technology allows you to connect to Bluetooth-enabled devices with the utmost ease.